You can enjoy a meal at the restaurant serving the guests of Catalonia Park Putxet Hotel, or stop in at the snack bar/deli. Wrap up your day with a drink at the bar/lounge. Buffet breakfasts are served on weekdays from 7:00 AM to 10:30 AM and on weekends from 7:30 AM to 11:00 AM for a fee. The 4-star Hotel Ronda Lesseps is situated in the north of Barcelona, providing tourists with an ideal base to explore the city. Find Gaudí’s Park Güell and Gracia Quarter within short walking distance of the hotel. You can reach the city centre in 10 minutes by bus or Metro. A self-service buffet breakfast is provided each morning and The Coffee Shop serves refreshments and light snacks right through the day. Wi-fi is available throughout the hotel. Guestrooms are spacious and equipped with air conditioning, cable TV and a safe. Situated 100 metres from Fontana Metro Station in Barcelona's popular Gracia district, Aparthotel Silver offers a 24-hour reception, a bar and a garden terrace. Rooms include free Wi-Fi and a kitchenette. Each air-conditioned room at Aparthotel Silver has simple, elegant décor. All rooms offer satellite TV, a laptop safe and a private bathroom with amenities. Kitchenettes include an electric oven, kettle and fridge. You can enjoy a drink in the Silver’s bar, and room service is available on request. Staff at reception can also arrange car or bicycle rental and provide information about the city. Silver Aparthotel is 200 metres from Casa Vicenç, a Gaudi building. Barcelona city centre is within a 10-minute Metro journey, while Parc Guell is just one Metro stop away. 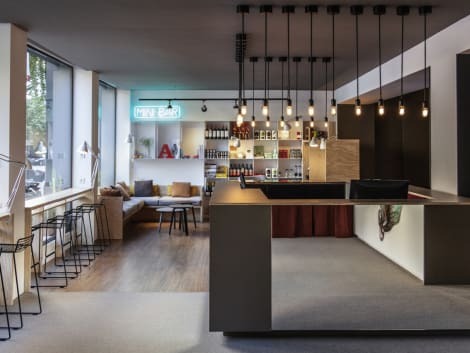 In the center, in the quiet district of Sarrià-Sant Gervasi and just 10 minutes from Barcelona's old town on public transport, you will find the Mercure Barcelona Condor, a modern, urban hotel, ideal for a comfortable stay in Barcelona. The hotel has 78 rooms, free WIFI, car rental services and parking facilities, as well as 2 rooms for organizing events. Satisfy your appetite for lunch or dinner at the hotel's restaurant, Snack Bar, or stay in and take advantage of the room service (during limited hours). Quench your thirst with your favorite drink at the bar/lounge. Buffet breakfasts are available daily from 7 AM to 10:30 AM for a fee. With a stay at MH Apartments Gracia in Barcelona (Gracia), you'll be within a 10-minute drive of Casa Mila and Casa Batllo. This 4-star apartment is 0.6 mi (0.9 km) from Passeig de Gracia and 1.3 mi (2 km) from Park Guell.